Arc’teryx Altra 65- Water bottle mesh developed small holes. At 5 pounds, pack is too heavy, despite excellent comfort of the waist belt and shoulder straps. Pack liner- pleased with strength of trash compactor bag. rain skirt- no longer made by ULA, Velcro closures detached, as did waist elastic. Required considerable trailside sewing to be functional. -rain jacket ( Patagonia Spectre) small tears, seam separation under one arm. Repaired with McNett clear tape. Tarptent -Moment – I wrecked the zipper, also tore the top of the vestibule. Needs professional repairs. I have never used a footprint in my life on any tent. 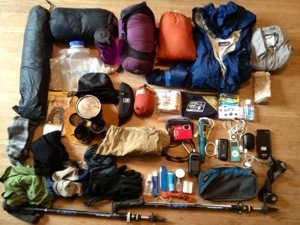 Western Mountaineering/stuff sack, 20F- excellent, except for worn zipper pull after 2.5 thru hikes. Quick free repair by WM. 1 Ibex wool long sleeve zip T shirt- replaced by Backpacking Light’s merino hoodie. 1 Ibex long tights- sustained the whole trip, developed several large holes. 1 socks wool – handmade by my wife, sustained after three thru-hikes. 1 headlamp w/ batteries (Petzl)- fine. 1 Exped Down mat 7- heavy, but sustained the trip. Looking for lighter alternative, maybe Neo Air. 1 Exped Comfort pillow, at 8 oz.,sent home, stuffed jacket into clothes stuff sack instead. 2 pr. Darn Tough socks- both pair sustained small holes that only developed in Montana, sending them back for replacement ( lifetime warrantee). 1 pr. Manzilla Windstopper gloves – stitching separated all over both. Bought another pair in Montana. 1 Ibex wool hat- material completely went to hell all over the hat. Still wore it. 1 pr. Patagonia mid weight stretch tights- sent home, replaced with pair of Columbia zip offs due to multiple pockets, and use as shorts. 1 Western Mountaineering Hooded Flash Down jacket- lost it on trail in Wind River range. Replaced with Synthetic ” Sherpa” brand jacket. 1 pr. 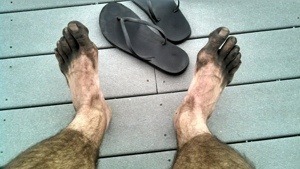 New Balance Minimus camp shoes- lost bushwhacking in Montana. Not replaced. 1 Steripen Adventurer- replaced w/ rechargeable Ultra model. Flawless. 1 “Four Dog” Bushcooker LT1 multifuel stove, W/ titanium windscreen,W/ Titanium cook pot 700 ml modified w/ lid 10 oz.- flawless. Used wood, alcohol, solid fuel (hexamine). 1 water bottle – used Gatorade bottle-replaced w/ 4 Platypus bags. 1 qt. water bottle ( Tiki Mon). 1 Ursak Minor – food bag- still going strong after 2 thru’s. Bronner’s soap, 1 oz bottle. 1 spork- lost. Replaced w/ plastic spoon ( free from Wendy’s). 1 length 50′ cord and mini carabiner-bear bagging food. 1 small pack towel- sent home, used bandanna instead. 1 iPhone 4S with headphones, wall charger, and connector cable. Exogear-case for iPhone, has internal battery for 1 charge of iPhone. ANKER rechargeable battery with multiple tips for camera, Apple products, Steripen. This battery replaces Solio solar charger with ability to charge iPhone 3x’s. 1 pr. Leki poles- no breakage ! 9. First aid– small kit, badages, tape,needle, neosporin, plus emergency med prescriptions-Hydrocodone, Metronidazole, Amoxicillin,Ciprofloxacin.